This symphony’s newest season is off to a starry beginning and a schedule that boasts some big names in the music world. Discover which impressive conductors make an appearance in Elgin. 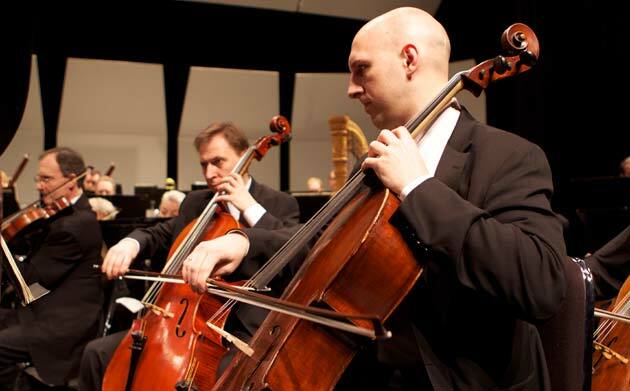 Matt Agnew, foreground, Elgin Symphony Orchestra’s principal cellist, plays alongside Nazar Dzhuryn. The symphony is being directed this season by resident conductor Stephen Squires and a host of renowned guest conductors, as the organization searches for a new music director. It’s been said that every ending is but a new beginning. This season, at the Elgin Symphony Orchestra (ESO), that maxim is proving true. Following the unexpected retirement in July of music director Robert Hanson, who joined ESO in 1974, the organization overcame the challenge of filling the vacant conductor’s podium for the season, drawing upon the enthusiasm, teamwork and creativity of its staff. At the opening concert in September, world-renowned artist Ignat Solzhenitsyn kicked off a stellar lineup of ESO guest conductors who queued up to direct the orchestra. Resident conductor Stephen Squires, who’s been with ESO for 20 years, is conducting three of the four concerts in the pops series, one classical program, the holiday pops and ESO’s benefit concert for Feeding Greater Elgin. And education conductor Randal Swiggum wields the baton for the three Family Fun Series concerts. That still left about half of the performances open, but within a month, the organization had confirmed all of its guest conductors for the 2011/2012 season. Either Dr. Dale Lonis, the organization’s CEO, or Mallamo had worked personally at some point with every guest conductor, and the pair’s combined experience helped to secure them. But the overwhelming response is also very much a reflection of ESO’s reputation, earned over its 61 years. ESO burgeoned under the leadership of the late Margaret Hillis, a Grammy-Award-winning conductor, and Hanson was her protégé; during Hanson’s tenure, ESO was named Illinois Orchestra of the Year three times by the Illinois Council of Orchestras, an honor unmatched by others. That reputation is what attracted Mallamo, who joined the ESO staff last year. The organization remains focused on its mission to bring the power of symphonic music to as many people as possible. School outreach programs include six “Bach to School” ensembles, made up of ESO musicians, that perform at area schools and offer insights into the instruments and music. Venezuelan-born Spanish conductor José Luis Gómez will hold the baton for ESO’s Feb. 4-5 performances. ESO’s participation in the national Carnegie Hall Link Up program allows student musicians to play with ESO; in the spring, Swiggum conducts concerts designed for specific age groups. Guest artists hold master classes. For the general public, “Musically Speaking” is an introduction to the composers and music, presented by music scholars Dan Maki or Jim Kendros an hour before each concert. The “ESO Listeners Club” is held at Gail Borden Public Library a week prior to each performance, featuring composer and music historian Kendros, who talks about the upcoming program and plays excerpts from the pieces. The schedule of performances has generated anticipation not only among subscribers, but staff members as well. 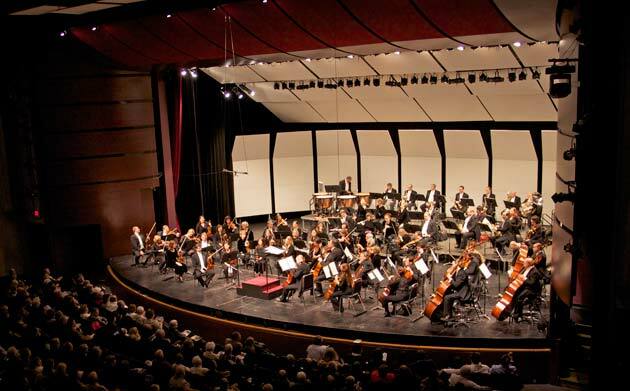 Elgin Symphony Orchestra performs in the Hemmens Cultural Arts Center in Elgin. 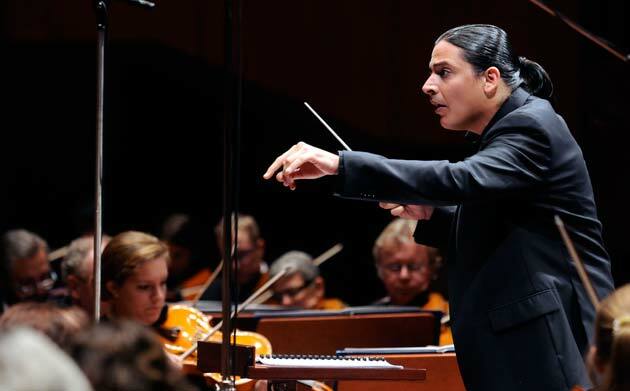 Next season’s slate of music and guest conductors is already being planned, and the search for a new music director is underway. Henry Fogel, who’s served as president and CEO of both the Chicago Symphony Orchestra and the League of American Orchestras, is assisting with the search. ESO hasn’t established a final deadline for filling the position. All agree that the most important value is the quality of the music. ESO is one of the highest-paying orchestras outside of Chicago, helping to attract top-tier musicians. The orchestra’s 2007 Aaron Copland CD is on Naxos, an international label. The Illinois legislature has deemed ESO a State Treasure. “Our goal is to maintain that quality – and build on it – in our journey forward,” says Mallamo. The organization is confident in that journey. “We’re energized by our forward momentum and the changes we’re instituting,” says Healy. “The feedback from our first concert was so positive that I’m completely elated,” says Hulett. “We’re carefully navigating the direction we take, so that we end up where we want to be. And along the way, we’re involving everyone in the organization. This entry was posted on Wednesday, November 23rd, 2011 at 12:00 pm	and is filed under Arts & Entertainment, Top Posts. You can follow any responses to this entry through the RSS 2.0 feed. Both comments and pings are currently closed.